Booking Now for 2019 and Beyond! Have 'Harp - Will Travel! Contact Ginger to Play For You! Your School, Library or Seniors! Or wait! What if you don't want a regular type person? What if you need a FLOWER PIXIE! Well, we have THAT covered, too! Now booking for Posie the Flower Pixie! She entertains K.O.A.A. - Kids Of All Ages!!! She loves to be Outrageous and Fun and oh.... just Magical! Ginger's music is just what you need at your venue. Bring her unique style to your next event to add a delightful flair. Let her turn a regular party into a memorable house concert for you! Ginger can provide a wide choice of music for you. From familiar song and original vocal pieces to memorable instrumentals, she always touches hearts. 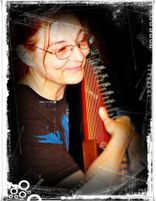 Folk, Celtic, New Age, Fairy, Contemporary - Ginger's tunes are perfect for any audience. Ginger is a natural storyteller. She's developed several programs for children about the Earth, History and Music. She also loves connecting with older folks, playing many of the songs they knew in younger days. Classic folk and even some soft rock tunes are in her bag, too. 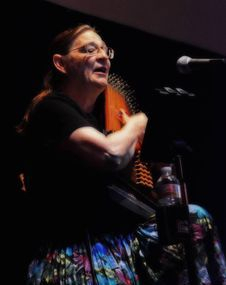 Her unique musical arrangements on the autoharp and penny whistle bring a fresh dimension to both old and new melodies! Have a band and need a guest performer? Call Ginger and she will bring her whistles, autoharp, vocals and bodhran drum to join you! Who knows... it may become the next great thing! Or leave Ginger an online message! Just fill out the form below and click "Submit." Ginger will respond as soon as she gets it!